Here, I mentioned that Keith accidentally purchased 2 acorn squash seedlings. I had never had it before. I guess I never will. Read on. I need to let you know that it died. Gone forever. Kaput. Compost. (Com-pissed is more like it. I mean, what the hell?) Some fungus, powdery mildew took over the leaves and stems and so the stem with the squash broke off completely. Look at this picture. Gross. 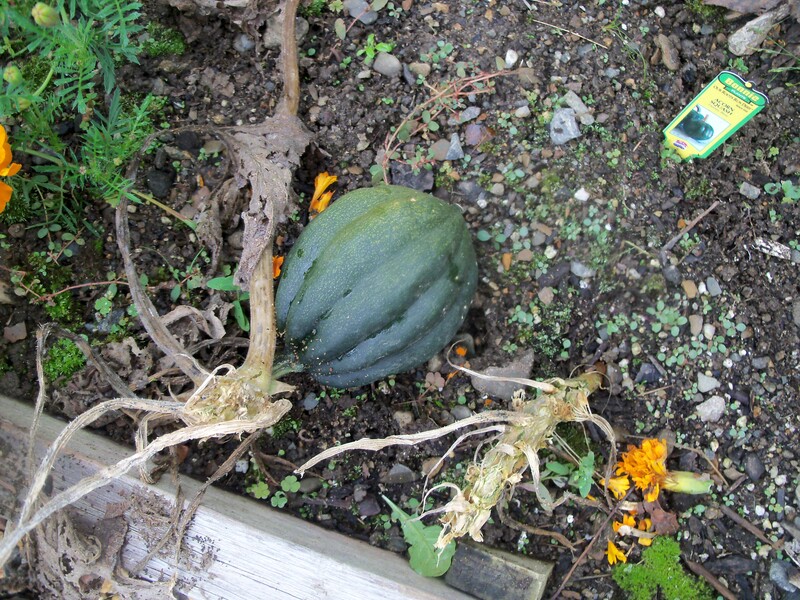 Former DaisyPatch Farm resident, Acorn Squash, 4 mos., died September 22, 2011 in his garden bed. No service will be held.Mr. Squash was born May. 10, 2011 to Comstock, Ferre and was moved across the country, living in an Agway for a short period of time before being adopted by the owners of DaisyPatch Farm. Acorn could accomplish anything he set his mind to do. At a very early age, he grew one leaf, then another, and continued to grow leaves, despite the loss of his infant brother and his cousin, Butternut in a freak dry spell. Acorn served in the United States Squash Force during operation Zucchini. Mr. Squash spent more than 3 months in New Hampshire. He never married. He is survived by distant cousins, the Giant Pumpkins. Condolences may posted here under comments. I threw away the remaining 5 ziploc bags of shredded zucchini that had been stored carefully in the freezer since the Summer of 2009 immediately after posting that article. PROGRESS.